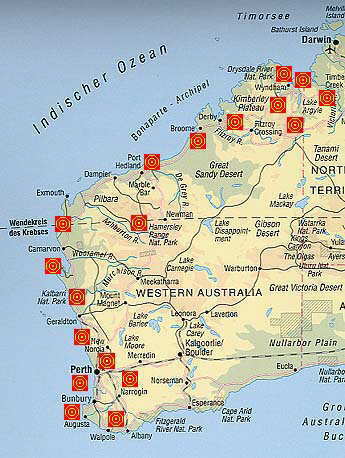 Western Australia is the largest state of Australia with an area of 2,53 million square kilometers and is often just called 'WA'. After the English man William Dampier reported of a dry and barren land in 1688 it took about 140 years until the first English settlers came to Swan Valley which was later renamed Perth. But the population increased slowly until the gold rush in the end of the 19th century. There are about 1,8 million people living in Western Australia, the capital Perth finds a home for 1,1 million inhabitants (in 2000).